The most important elements of your sunglasses are the lenses. Through advanced lens technology, polarized lenses selectively filter horizontally reflected, visually interfering light waves know as 'glare'. The elimination of direct and ambient glare results in superior visual clarity, definition, color transmissions and optical comfort. They accomplish this feat through a process called 'polarization', much like a 'venetian blind' controls sunlight through a window. Polarized lenses have a laminated surface containing vertical stripes. These stripes only allow vertical polarized light to enter your eyes. Glare is eliminated because the horizontal light is unable to pass through the polarized filter. Polarized lenses are used in sunglasses to reduce glare from reflective surfaces such as a body of water, the hood of a car, or any surface the sun can bounce off of. The only way to eliminate glare is to place a polarized lens in its path. Categorized as either UVA or UVB, these invisible ultra violet rays from the sun can cause serious damage to your eyes leading to cataracts, macular degeneration, or permanent retinal impairment. Studies have shown that permanent damage to the eyes can result from prolonged exposure to the sun without adequate protection. Ultra violet (UV) light is the component of sunlight most responsible for eye damage. Excessive exposure, especially from light reflected from sand, snow or pavement, can produce a burn on the surface of the eye. 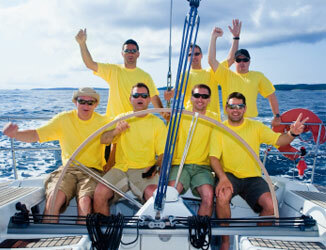 Although darkly tinted sunglasses may reduce brightness, they do not remove glare as does a polarized lens. In addition, dark sunglasses without added ultraviolet protection may cause more damage to the eyes than not wearing sunglasses at all. The darkness of the lens can cause the pupil to dilate, thus letting more ultraviolet rays into the inner parts of the eye. Polarized lenses solve both problems by eliminating glare and filtering out harmful ultraviolet light because the filter reduces the polarized glare and also has ultraviolet absorbing properties. Grey Tinted Lenses - The best lens for intensive sunlight conditions in as much as its low visible transmittance, combined with 99% polarizer efficiency, provide maximum protection against the sun. A popular general-purpose choice reducing light intensity, while maintaining original color, with no distortion. Relieves glare and increases contrast. Brown Tinted Lenses - An ideal lens for fishing and golfing as it combines 99% polarizer efficiency with high blue light absorption and, therefore, provides high contrast and sharp contour definition. Sharpens visual acuity and enhances depth perception. Ideal for bright sun and overcast conditions. Copper Tinted Lenses - The best lens for driving because it has the best compromise between visible light transmittance, blue light absorption and a high red factor. This results in enhanced reds such as traffic lights and car brake lights. Enhances color contrast sensitivity and sharper image under variable weather conditions. Developed to enhance color contrast, depth perception and detail recognition. Polycarbonate lenses have many benefits and are the recommended lens material for children because of, amongst other things, their incredible strength. Polycarbonate material was developed by the aerospace industry for use in the space program. It can also be found in police shields, airplane and bulletproof windows. The great strength of polycarbonate lenses means that it is incredibly hard to break even in the roughest of situations. Polycarbonate sunglasses will not shatter. Our anti-scratch coating will keep the lenses scratch free and protected from everyday wear and use. Another benefit of polycarbonate lenses is that they are 35% lighter in weight than any other lens material. Polycarbonate lenses are thinner than the usual plastic lenses, as well as the material itself being lighter than plastic. This means that the sunglasses themselves will be that lighter, thus adding to overall comfort. A great benefit of polycarbonate lenses is that they offer ultraviolet (UV) radiation protection, protecting around 99% of these potentially damaging rays - it does not matter whether the UV rays are from direct sunlight, your computer screen or indoor lighting.